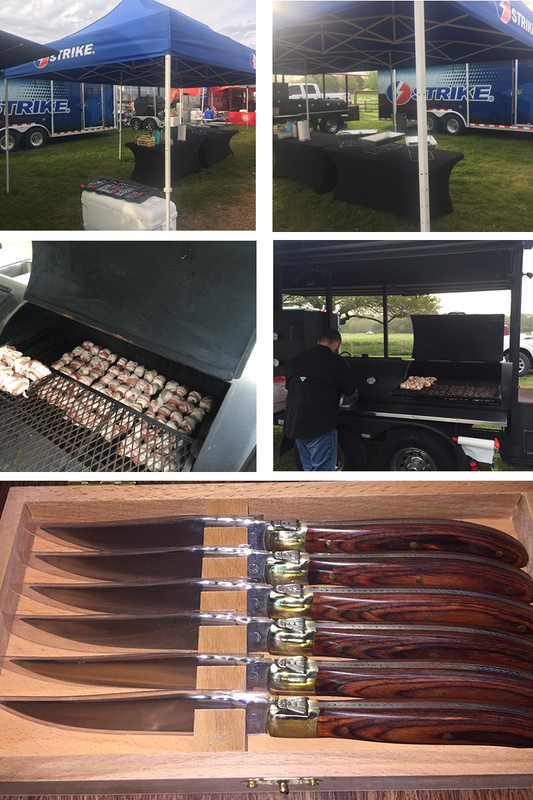 Strike&apos;s Cook Team was named Top Cooker at the Spring 2017 Houston Pipeliners Clay Shoot Out on March 10 with their bacon wrapped quail and special sauce. Kelly Goudeau, Strike&apos;s Cook Team Leader, is always putting out crowd favorites. In 2016 alone, they served nearly 5,500 people. Kelly attributes a lot of his success in the culinary arts to something his grandfather taught him called Mise en place - a French culinary phrase which refers to having all your ingredients prepped and ready to go before cooking. The Strike Cook Team was awarded with a beautiful set of Laguiole brass bolsters steak knives made with exotic wood for taking first place. The Houston Pipeliners Association is a non-profit association of professionals in the energy industry which offers networking and educational opportunities while advancing oil and gas pipeline engineering and operation practices. The association puts on several events throughout the year and Strike&apos;s Cook Team often cooks at these events.